Make sure that the items in your closet are all fitting and enhance the shapes of your body. Good clothes are the ones that can be worn with many different items in order to obtain many different looks. The best way to clean out your closet is to first organize them by season, then item, and last by color. 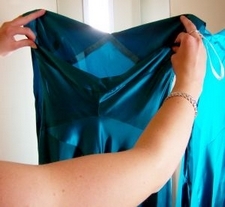 This will make finding clothes in your closet a lot easier. If you know you don’t wear something or don’t look good in something throw it out. Having excessive amount of clothing that doesn’t fit brings down your self esteem and prompts negativity. This include the clothes you plan on wearing “after” you’ve lost weight. Tailoring needs a little maintenance, like torn pieces or stress at the zippers or missing buttons. This includes any clothes that you love that don’t fit so great. Making friends with a tailor that can fix your clothes will build your self esteem and allow you to keep that item of clothing that you love so much. Donate to Charity dated styles, wrong sizes in good conditions. You will feel empowered when you donate your clothes to people that are less fortunate. Dry cleaning or storage –anything not in season. Make sure you clean these items. Trash things that are too embarrassing, anything that is out of shaped stretch or cheap. Always throw out items that don’t fit the way you want too, and are way passed being helped by a tailor.